Our historical combat class for adults continues November 2nd at 8pm in Okehampton. Progressing with single sword, sword and buckler, dagger and rapier, there is optional light free-play in some of the weapons. 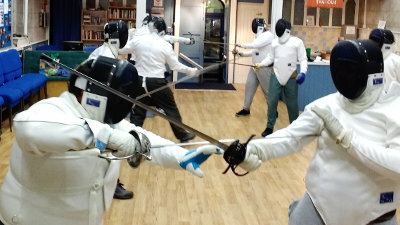 We will be studying and applying techniques from historical manuals; the class will be no more demanding than a moderate physical exercise class; size, strength or agility are not limiting factors for this beginners’ class. Light protective equipment (fencing jackets, masks, gloves, chest protectors and arm-guards) will be provided for use in class. Please note this is the study of historical combat techniques, it is NOT re-enactment, stage combat, LARP or other role-playing. Please see our post ‘What is HEMA’ for further information. Safe training and sparring is our primary concern. See our post: HEMA – is it safe? The cost is £25 for 5 weeks. Reply by email to westdevonswords@gmail.com, use our contact form, or call 07956 409818 to reserve your place. Please pass on to friends, family and colleagues who may be interested.